Carter's has a great printable coupon available. Save 20% on your in-store purchase of $40 or more. Or, save 15% on your entire in-store purchase. The only problem is that the validity of the coupon ends today (04/20/2016)! So, there is no time to hesitate. Find your nearest carter's store location in the U.S. through our store locator and enjoy the offer. 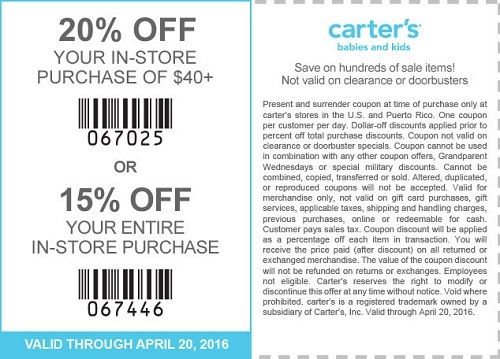 You can get your own coupon through carter's emailing. Source of the information is carter's. For more information about the coupon visit your nearest store location or carter's online.